Bob Dylan once said that to live outside the law you must be honest. But then, he never found himself caught between the law and the villains! Everyones after Burglar Bill, and he never did anything wrong in the first place. Well, except for that whole burglar thing... THIS ISSUE: Its Police Constable Stephen Hills first night on the beat, and hes finding out that the day-to-day drudgery of police work doesnt quite live up to the excitement of the police programs he watched when he was growing up. But when Burglar Bill crosses his path, things take a turn for the worse as Hill comes face to face with real-life crime and violence. 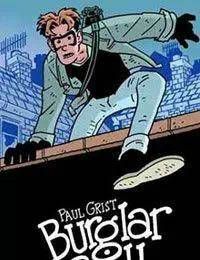 A revised reprint of BURGLAR BILL originally published by Dancing Elephant press, this issue also includes a 10-page prologue and the very first BURGLAR BILL story from 1986!